The last time an American distance runner won a gold medal at the IAAF Track and Field World Championships was 1964. 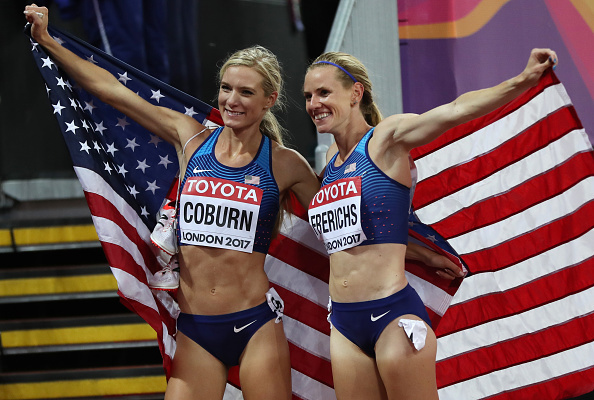 That changed last Friday night when Americans Emma Coburn and Courtney Frerichs snagged gold and silver in one of the greatest steeplechase races ever. While the race itself was remarkable, the psychology surrounding it is equally compelling. For one, Coburn’s winning time of 9:02.58 not only set a course record, but it also bettered her former American record. Second, Frerichs ran a staggering 15.32 seconds faster (9:03.77) than her former PR (9:19.09) to edge out bronze-medalist Hyvin Kiyeng of Kenya for silver. Third, despite missing the first water jump, fourth-place finisher, Beatrice Chepkoech of Kenya, still managed to keep her head in the race. And finally, Coburn recently switched coaches. She is now working with her 27-year-old fiancé, Joe Bosshard, a former collegiate runner with no coaching experience. Frerichs heeded her coach's advice to stick with Coburn, which is, perhaps, how she managed to pull off such a phenomenal performance. Why? Coburn is known to be an excellent tactician and racer. Frerichs and her coach created a race plan accordingly. We’re always told to run our race, but sometimes we have to adjust plans based on competition and race-day conditions. Going into a race knowing who our competition is, how they run, and where we can leverage our strengths alongside them is paramount for building confidence and regulating ourselves on race day. This is important for not just winning races, but for pushing ourselves and each other to our absolute bests. From a psychological perspective, what is the advantage of running a race with a training partner, teammate, or friend? Training with someone and seeing their successes and breakthroughs help us have perspective, like when Coburn saw Frerichs running well in the steeple on Friday, and said to herself, "She's doing this, I can, too." Take a look at the history of American distance running: In the 1960s and 70s, we were a running powerhouse. Then, in the late 1980s into the early 2000s, when elite runners began training on their own rather than in groups as they had been in the 1960s and 1970s, we stopped medaling in world events. After only one man qualified for the Olympic marathon in 2000 (Rod DeHaven), training groups like the Hansons Brooks Distance Project, Team USA Arizona, Mammoth Lakes Track Club and, eventually, the Nike Oregon Project, all brought group training back on the map. And now, thankfully, we are starting to see how groups of people dial in, train hard, and feed off of each other’s successes for the better. In short, we're stronger together. Trust in a coach and happiness with that relationship goes a long way. For example, Coburn recently started working with her 27-year-old fiancé (a former collegiate runner) with no coaching experience. What role does our relationship with our coach play in our ability to run well? Sophia Jowett is a sports psychology researcher who has found that successful coach-athlete relationships develop with closeness (trust and respect), commitment (loyalty and intent to continue the relationship), complimentary behaviors (affiliation with one another), and co-orientation (established common ground). And, while the physical work we do is critical to creating success on the track, roads, or trails, at the end of the day, respect, trust, and care are all at the core of successful coach-athlete relationships. Immovable barriers and a water jump make the steeplechase a grueling event. In this year’s World Championship race alone we saw Beatrice Chepkoech of Kenya miss the jump, fall, and still appear to keep her head in the race. What lessons in grit can we extrapolate from the steeplechase to use in our training and daily life?Grit is all about passion and perseverance towards our goals, and Chepkoech demonstrated that, despite a setback, she was completely resolved to battle and pursue a championship. I think we all can learn that mistakes do not condemn the outcome, but rather, they are part of the process. You said earlier that Coburn is a great tactician on race day. How can we all learn from her? One of the reasons Coburn is such a great racer is that she shows up with a plan and probably uses visualization to actualize it. And visualization is a powerful tool to motivate, excite, and prepare ourselves to respond to adversity. I advise my athletes to make sure they practice visualization of all of their senses (seeing, tasting, feeling, smelling, and hearing) to create both ideal and difficult scenarios and learn how to overcome them ahead of time, thus paving the way for success. I also encourage them to play the scenarios in their minds while running key parts of workouts and when tapering. Imagery can tune the mind with the body and help create a calm, confident mindset before a competition. When I was running in college, during the last 200 meters of interval work on the track, I would imagine making a move to kick and win a championship. It helped keep me stay motivated and focused so that when the time came on race day, I was ready to respond. Confidence is half the battle. How do we build it? Drugs are tested against placebos because the mind has a dramatic impact on how we feel and respond (the placebo effect can reduce fatigue, inflammation, and other physiological responses up to 30 percent). In short, what we think and believe is vital to producing actions that win us PRs. I like to have my athletes chart three columns: Event, Thoughts, and Actions. I then have them identify actions of great athletes, write out situations that are difficult to deal with, and then the thoughts they have about those situations. I ask if those thoughts lead to what great athletes do. If the answer is no, I ask them to think about how to respond, not react haphazardly, to be what they aspire to be. It’s a simple, but powerful exercise that gets athletes thinking about their thinking. And, finally, as you said earlier, Chepkoech gave us a perfect example of resilience during her race. How can we apply that mindset to our own lives and training? Resilience is such an interesting topic. ... Why is it that some people can experience adversity and come back or even grow from the experience and others cannot? What we know about resilience is that people possess characteristics that enable them to be resilient, but that resilience comes from our relationships, and from our environment (it has a social component). We also know that we can become more resilient if we're optimistic, mindful in the present moment, and if we communicate effectively to overcome obstacles. In short, we can learn resilience; it's not something we are born with or without. A simple training strategy that I like from my college running days is to surprise runners with an extra interval after a hard workout. My teammates and I would always hammer the last interval of every workout. If our coach told us "one more” after that, mentally, we were ready to check out, but it forced us to dig deep to squeeze out just one more. It kept us ready to respond, and it taught us resilience. Interested in working with Dr. Gonzalez? Check out his website or shoot him an email.